Braintree is a town in the north west sector of the hiking trails of the south shore. Braintree, only 10 miles south of Boston can be considerably heavy with traffic at rush hour. This close to Boston makes this town a very desirable place to live for those who have to work there. fairly well away from the heaviest traffic congestion. a secluded forest conservation area. 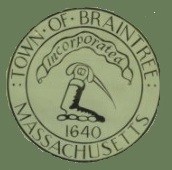 Calls itself a town rich in history (the original braintree referred to as "Old Braintree" contained the current city of Quincy along with other towns such as Randolph, Holbrook, and part of Milton). Old Braintree the birth place of John Adams, John Quincy Adams and John Hancock and later named Quincy in honor of the two presidents. For this reason both current towns of Quincy and Braintree claim much of the same history. Settled in 1625 and having former names such as Mount Wollaston and Merry Mount. Named after an English town and incorporated in 1640. Subsequently the other towns breaking away Quincy in 1792 Randolph and Holbrook as the town of Randolph in 1793. This "town" has recently grown to a city having changed it's town government to mayor-counsil in 2008. This park's main trail is paved making it a good steady choice for hikers of all ages. 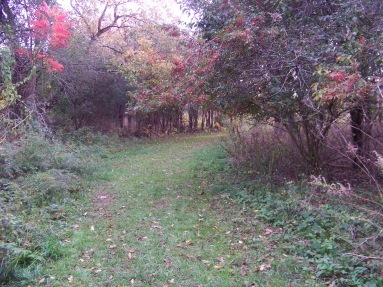 There are smaller side paths that detour into the woods or meadows. All the trails circle Pond Meadow Lake Reservoir where many people go to fish. There is plenty of parking at this park. 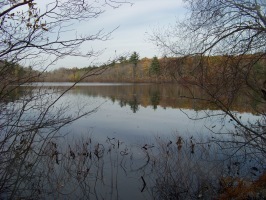 Located in the Braintree Highland section of town, this forest can be accessed by the Charlie Moore trail. This trail is located on Peach street with a kiosk and area cleared for parking by the side of the road. The trails in this area are the most southerly in Braintree. The property comes down to the Holbrook/ Braintree line at a powerline on Liberty st.
Liberty st. becomes Pine st once in Holbrook. Across this powerline from the reservation lies the Holbrook town forest and it's trails. 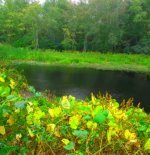 There are several small entrances to the cranberry pond reservation. One is off Old Liberty st.at the end of Hillsdale Rd where there is a kiosk at the side of the road at one trail head. This is the only trail in Braintree of the Blue Hills Reservation. This one is an abandoned road that travels through wetlands heavy in bird habitat. It is older pavement that eventually leads to a path that circles a small area beside rt. 24.